Today is the Ides of March so I thought I’d keep up the little tradition I’ve established of posting this priceless bit of British cultural history relevant to such a fateful day. 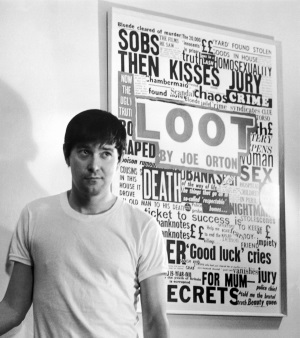 Joe Orton, photographed on 1st March 1967. The playwright and author Joe Orton died on August 9th 1967, which is exactly 50 years ago today. 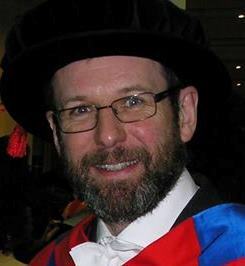 I couldn’t resist a short post in his memory. Relating to or characteristic of the English playwright Joe Orton or his works, especially in being unconventional and darkly comic. My first experience of Orton’s plays was seeing an amateur dramatic society production of Loot when I was a student. I have to say it was a dreadful experience, but that was because of the performance not because of the script. Loot is basically a farce, and I think that must be the most difficult form of comedy to do successfully. The timing has to be perfect, the pace has to be relentless and everyone has to act as if all the absurd things going on make perfect sense. Those are tough requirements for amateurs, and even for professionals. The first, provincial, run of Loot was a flop even with an experienced cast. It was only when it was revived a couple of years later that it became a hit. The circumstances of Joe Orton’s death were terrible: he was battered to death by his partner Kenneth Halliwell (with whom he lived in a small bedsit) who then committed suicide by taking an overdose of sleeping tablets. Orton and Halliwell had been in a relationship since 1951. Joe had never made any secret about his enjoyment of casual sexual encounters – his diaries are full of descriptions of his adventures – but I think it was the thought of living alone rather than sexual jealousy that Halliwell couldn’t handle. Rest in peace, Joe Orton (1933-1967), author and gay icon. P.S. On a less frivolous note, today the good folks of the Netherlands are going to the polls. I hope that they use their votes wisely, but am more than a little nervous about the outcome. Today is the Ides of March and we’re entering the final straight before crossing the finishing line of term and collapsing in a sweaty mess into the arms of the Easter holiday. I’ve been ridiculously busy today so, being too knackered to think of anything else to post, I thought I’d tap into a priceless bit of British cultural history relevant to this auspicious day. While I’m in a festive mood, here’s a party piece to end all party pieces. It’s a tribute to French language and culture, performed by the sublime Kenneth Williams. 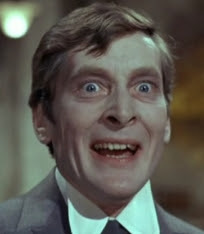 While watching Carry on Screaming on the telly tonight, I was reminded of the similarity in visual appearance possessed by the villainous Orlando (played by Kenneth Williams) and the distinguished Astronomer Royal, President of the Royal Society and Master of Trinity College, Cambridge, and the Universe, Lord Rees of Ludlow (who, I hasten to add, is not at all villainous..).